Hazaribagh is rich in art and culture which is reflected in the handicraft items and traditions of this region . Its culture is rich, diverse and unique. Sanskriti museum and Art Gallery is one best way to have an insight of Hazaribagh’s Art and Culture. 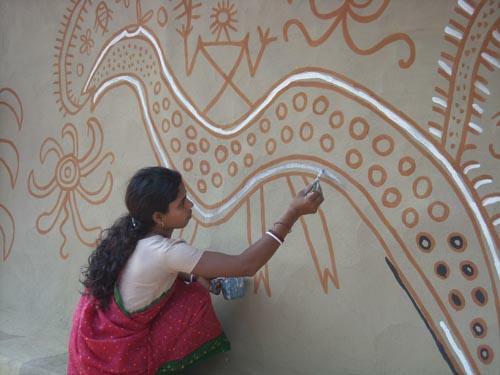 Hazaribagh got its famous Art form "Mural painting" from pre – historic times. Stone age tools were discovered from Hazaribagh. Hazaribagh is also famous for its tribal art form. Unlike other metropolitan cities, Hazaribagh is not about night life, discotheques or high profile parties. This place is more about its famous temples and traditions. One may not find shopping avenues as majority of people favor shopping in local markets. The mindset of the people are dominated by Indian cultural values and beliefs. Hazaribagh has got mixture of all communities/religions. Almost each tribe residing in Hazaribagh has developed their unique language, art and culture. Hinduism is the principle religion of Hazaribagh. Most of the people follow Hinduism. Other prominent religion present here are Islam, Sarna and Christianity. Jainism, Sikhism and Buddhism are other basic religion followed by people of Hazaribagh. Being a hindu dominant area one can find the presence of few very famous hindu temples in Hazaribagh. Some very famous temples in and around Hazaribagh are Narsigsthan temple, Rajrappa, Bhadrakali templeand many more. A famous Jain temple Parasnath temple is also present in the close vicinity of Hazaribagh. The languages spoken in the town are Hindi, Santhali, English and other tribal languages. Hindi is a common language spoken by the inhabitant of the city. All government communications, advertisements, media communications and public activities are done in Hindi. Due to educational institutes and literacy, English is also a formal language for business communications. Santhals the primary tribe of Hazaribagh speaks Santali, which is allied to the Mundari language. Another local language known as Kharia, which is a branch of Munda family of languages is spoken by primitive Kolarian tribe. 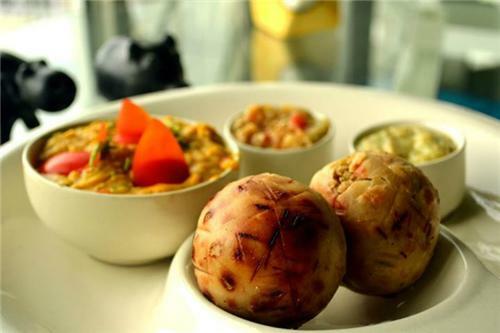 Hazaribagh is famous for its street food which is both vegetarian and non-vegetarian. Bagheri jhor along with rice is the staple diet of the people here. The common snacks eaten by the locals includes kachori, samosa and dhuska bada. Kebabs of chicken and mutton are also popular and its taste is very different from what can find in northern India. Folk music and dances are part and parcel of the tribal culture in Hazaribagh. People sing and dance in open places according to seasons. Popular Folk dances of the region are Paika, Jadur, Santhal, Chhou, Karma, Nachni, Natua, Agni, Matha, Sohrai, etc. Folk Music like Mardana Jhumar, Faguwa, Janani Jhumar, Dohari Domkach, Jhumta, Akhariya Domkach, Udasi, Pawas, etc. are very popular. 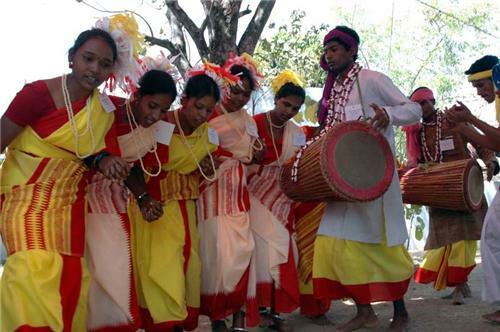 Domkach: It is also a typical dance of the Chotanagpur region. It is performed by the women from the groom's side. Gajalaxmi Puja: it is one of the most important festival celebrated by people of Hazaribagh. It falls in the month of September and October.People in Hazaribagh also celebrate Dusshera with great passion. Ramnavi is a three day festival celebrated with joy all over Hazaribagh. The large crowd involved in this festival forces the administration to ensure high security in the region during this period. Stone age tools, Mesolithic rockart sites, stone tools, microliths, Neolithic stone tools, and pottery shards were discovered from Hazaribagh The village paintings are considered auspicious symbols related to fertility. These paintings are painted on the walls of the houses. On the basis harvest and marriage seasons these arts can be divided in 2 major forms namely Khovar and Sohrai. The paintings are done using three major techniques comb-cut; finger-cutting or painted. Khovar is the marriage art of the tribals and semi-hinduized tribes of Hazaribagh living in hill villages. Khovar or the Comb-Cut art done during the marriage season.Sohrai is the winter harvest art. Cloth swabs or chewed twigs of the local Saal forest tree is used for preparing great Sohrai painting. Town played host to great writers like Sanjiv Chattopadhaya (of Palamau fame) and Rabindranath Tagore. The poet Kamini Roy lived in the town for some years. The noted Bengali author and writer for many Hindi films like SUJATA, Subodh Ghosh was born and brought up in Hazaribagh. Many of his stories are set in the region. Keshub Chunder Sen, the great Brahmo Leader has written many pieces during his short stayin the town. Rabindranath Tagore travelled in Hazaribagh famous push-push in 1885 and recorded the experience in an essay, Chotanagpur families. In hazaribag the prominent language is khortha speaks by most of local people . It is also a connecting language between sadan and adivasi. The prominent festival of hazaribag is Manda puja and Mansa puja along with Karma , Baudhi, ,Sarhul etc .